From its very inception at Kimberley in 1892 the annual get-together of the country's best golfers was called the South African Tournament. The main event on that historic occasion was the inauguration of the SA Amateur Championship. In later years other major championships were also included on the programme, the SA Open Championship in 1903 and the Professionals' Match Play Championship in 1923. But essentially the annual get-together of the country's best golfers was a tournament, a celebration of golf, rather than a championship meeting. Certainly the championships were of major importance but in addition various team and handicap competitions were included to make up a full programme for the enjoyment of all the golfers who had made the trip. This made good sense. Travel around the country was a tedious and time consuming business at the turn of the 20th Century and through to the 1920's and 30's and golfers coming from afar to attend the Tournament expected, and got, more than just the promise of playing in one or two rounds of the Amateur. The programme at Kimberley that first year, in addition to the national championship, included an Inter-Club Competition and a Handicap Competition 'decided by strokes'. It extended over six days from 26th September to 1st October. This was the small beginning. As the years passed the programme became more and more elaborate with more and more competitions being added and, as a result, more and more extended. The Inter-Centre and the Inter-Club competitions were firm fixtures and various handicap events filled in the gaps between the major championships. In 1923 at Royal Cape no less than six handicap events were played, the Wynberg Handicap, the Ottery Handicap, the Royal Cape Handicap, the Tafelberg Handicap, the Mowbray Handicap and the Peninsula Handicap. Amateurs had to get time off for over two weeks, eleven days for the meeting itself, two or more for travelling to and fro and perhaps another one or two for practice. To make things easier the Tournament was arranged to be played over the Easter weekend and came to be known as the SA Easter Tournament or Easter Meeting. It is worth recording a typical programme; that for the 1927 SA Golf Tournament at Maccauvlei is an example. It reads like a marathon! In the event of there being more than 64 entries, the first round to be played on Sunday 17th. When roads were bad and motorcars few, many of the competitors travelled to the tournament by rail or, when applicable, around the coast by ship. To assist with these costs, concessions were negotiated with the Railways and with the Union Castle Steamship Co, the Railways offering return tickets at single fare rates and Union Castle offering a 20% reduction on the cost of their return tickets. No doubt many of the golfers took advantage of these offers. Up until 1925 the Amateur was played as a stroke play event and frequently concurrently with the Open. Entries were relatively few at that time and when the change was made to match play, there was no need for qualifying rounds. Nor was there seeding. It was a free-for-all from the start! A keen and successful amateur could play as many as 15 rounds during the 10 days of the meeting, an extraordinary test of endurance. When Clarence Olander won the Open and the Amateur at Royal Cape in 1936 he had to go even further. He tied with J Robertson in the Open and had to play-off over 36 holes for the title. It must be remembered too that in the earlier days the courses were at best rough and ready, with fearsome rough, poor lies on the fairways and, except where the greens were sand, extremely tricky greens. There were none of the immaculately kept courses of today. The commitment to the game of the likes of Doug Proudfoot, Jimmy Prentice, Lawrie Waters, George Fotheringham and the other early pioneers of the game is quite remarkable. In the first years and before the SAGU was founded in 1910 the SA Tournament, or SA Golf Tournament as it was called from 1902, was organised and run by the hosting club. To the fore in this regard was the Port Elizabeth Golf Club who hosted the Tournament five times in the years from 1893 to 1903 and whose members were responsible for so much of the development that golf enjoyed at that time. The ongoing success of the Amateur Championship following Kimberley's small beginnings was their doing and then later the PE Golf Club was also the main force behind the inauguration of the SA Open in 1903. They were ably supported in the early years by East London and King William's Town and tournament golf was very much the preserve of the clubs in the Eastern Province / Border area. 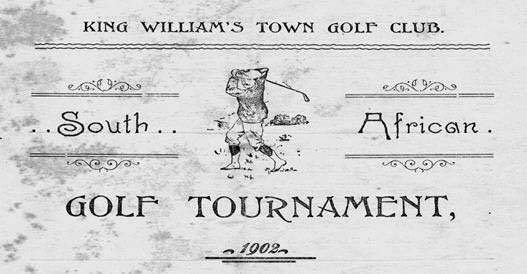 Even the first SA Ladies Championship was held at King William's Town. There can be no doubt, however, that the formation of a national controlling body, the South African Golf Union, was a major step in the right direction and once this had been achieved in 1910 the game, both amateur and professional, and not least the SA Easter Tournament, called the SA Golf Championship Meeting from 1919, went from strength to strength as a result. Mention has been made of the Easter Tournament as being a celebration of golf. It was also a great social event, the one occasion in the year when golfers from all over the country assembled to renew old acquaintances and make new friends. Amidst a great deal of après golf camaraderie and fun, highlights of the Meeting were the ball – black tie and evening dress – and the dinner which marked the closing of the Tournament for another year. The dinners were elaborate affairs and the evenings were brought to a close by a seemingly endless succession of speeches, everybody thanking everybody else for everything that had happened. In 1906 at East London there were no less than 19 speeches, starting with a toast to "Our Guests" made by the Chairman, followed by a response from a representative of each of the visiting clubs, nine in all, and also the amateur champion; then the mayor of East London spoke prior to giving away the prizes, 'a happy speech' according to the reports; he was followed by toasts to "Golf", a toast to the "Health of the Secretary", a response by the Secretary; a toast to the "Hosts" to which there was a response; a further toast to The 1906 Dinner Menu the "Hosts" made on behalf of the professionals and finally a toast to the "Health of the Chairman". It must have been some dinner! THE GOLF DINNER. A "golf" dinner was given last night to the visitors who have been competing in the South African Tournament. The function took place at Cohen’s Continental Restaurant, and the dinner was such as to satisfy even the most exacting epicure. The following was the menu: -res: Caviare, olives, sardellen. Soup: Golf. Fish: Mashie oyster patties, fried fillet of soles. Entrees: Putter crumbed lamb cutlets, meringue of chicken. Game: Brassey wild pigeon pie, larded guinea fowl. Joints: Driver roast rib of beef and horse radish, roast stuffed breast of veal, roast forequarter of lamb and mint sauce, roast fillet of beef al la jardinière, roast haunch of mutton and jelly. Poultry: Cleek roast stuffed turkey And Oxford sausage, roast stuffed duck And green peas. Boiled: Ox tongue, York ham. Vegetables: Baked and boiled potatoes, Asparagus, cauliflower, green peas. Sweets: Niblick pudding, chocolate éclairs, wine jelly, vanilla ice-cream. Cheese: Chedar and Gorgonzola. Fruits, slads: dessert in season. From time to time there was concern that the demand on the amateurs, particularly the low handicap golfers who entered for the Open as well, was too arduous and a decision was taken at the 1928 meeting that as from 1931 the SA Open and the Professionals Match Play would be played at a different venue from the Easter Tournament and on different dates. However, it appears that the separation of the Open and Amateur was not popular and at the SAGU meeting in 1932 it was decided to bring the two championships together again in 1934. This state of affairs continued right through to 1965 when finally the two major championships were split up once and for all, the Amateur retaining its Easter time slot and the Open becoming part of the ever-increasing professional circuit. Through the later 1930's and in the years following WW2, the SA Golf Championship Meeting retained much of the spirit and camaraderie of the earlier years. It continued to be more than just the major championships. Of importance to the competitors were the Inter-Centre Teams and Inter-Club Foursomes, which were hotly contested, and for the most part the handicap events also remained in place. The number of amateurs far exceeded the number of professionals and to a great extent the Meeting remained a gathering of friends and acquaintances. But this was all to change. By the mid-1950's the handicap events had been discontinued, in 1965 the Open and Amateur were separated with greater numbers of professionals in the field and ever increasing prize-money and in 1969 the Inter-Club Foursomes made way for the SA Stroke Play Championship. The Inter-Centre Teams competition lasted longer but it too eventually had to go. The notion of the SA Tournament as a celebration of golf had passed into history. More important, and in line with what was happening all over the world, were the major championships. Golf, and in particular the winning of championships, was a serious business and time was precious. The concept of a tournament extending over ten days or more was unthinkable; playing 15 rounds of championship golf over this period impossible; anything short of an immaculately presented course unacceptable.